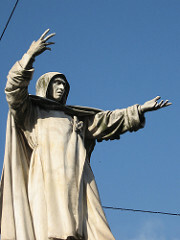 Girolamo Savonarola (1452–1498) was an Italian Catholic preacher and martyr. Outraged by ecclesial corruption and neglect of the poor, Savonarola preached against these sins, calling people to repentance and renewal in Christ. He was hanged and burned in Florence on charges of conspiracy and false prophecy. In his work on Psalm 51, he models how to pray Scripture, repenting of our sin and asking for life in God. According to the multitude of your compassions wash me thoroughly from my sin; for hitherto I have been cleansed imperfectly. Complete your work. Take away the whole body of sin. Take away the guilt. Increase the light. Inflame my heart with your love. Drive away fear, for perfect love casts out fear. Let the love of the world, the love of the flesh, the love of glory and self-love wholly depart from me. Thoroughly—and more and more—shall you wash me from my iniquity in which I have sinned against my neighbor, and from my sin with which I have offended against God.